If your Notification Area looks as blank as the image you see here then there’s something wrong with your registry. 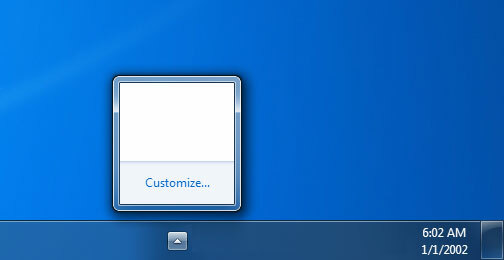 The usual fix for this is to turn your computer off and on again or simply logoff and login to the same account. However, that may be a bit extreme since you’re just out to Restore missing Notification Area icons. Don’t fret, the fix is easy. Important: This will require you to tweak your computer’s registry. If you’re not comfortable with that, just ask someone to do this for you. Back up the Registry by creating a restore point. Go to Start > Run (or Windows-key + R), type in regedit and hit OK.
Navigate to the key HKEY_CURRENT_USER\Software\Classes\Local Settings\Software\Microsoft\Wi ndows\CurrentVersion \TrayNotify. Then if the volume bar isnt there, go to taskbar properties (where the volume was gray) and simply tick the box.